No matter what eventually happens to Crecente's DNA, be it used to create a clone army or otherwise, he'll surely be in good company when his cells are committed to the International Space Station as part of NCSoft's Operation Immortality. 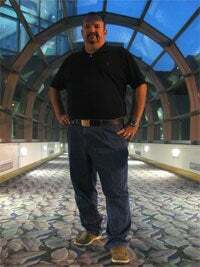 Best-selling author Tracy Hickman joins the cellular cast of the operation, his DNA traveling with Space Richard Garriott when he is launched into space on October 12th. Hickman is best known for co-authoring the original Dragonlance Chronicles trilogy with Margaret Weis. "Mankind is at its best whenever we set our vision to the stars," Hickman said. "One of my first memories was of watching Alan Shepard fly his Mercury capsule atop a Redstone rocket. I have lived my entire life dreaming of space. 'Operation Immortality' is essentially a celebration of that same adventuring spirit and an offering of hope for the future. I am deeply honored to participate." Not only will a swab of his DNA be included in the "Immortality Drive" but samples of his work as well, so the aliens will have something to read on the space toilet while waiting for our impending doom to propagate in their labs. Best-Selling Author to Send DNA Into Space Tracy Hickman, Famed Author of the Best-Selling Fantasy Fiction Series Dragonlance Plans to Send His DNA into Space as Part of NCsoft's Operation Immortality AUSTIN, Texas—(BUSINESS WIRE)—Operation Immortality™, the project to create a digital time capsule of the human race, has joined forces with famed author and game designer Tracy Hickman. Hickman is best known for his work on the Dragonlance novels and the innovative Ravenloft module of the Advanced Dungeons and Dragons game system. As part of Operation Immortality's mission to preserve the most talented and influential people of our time, Tracy Hickman will be sending his digitized DNA into space with video gaming luminary Richard Garriott as he travels to the International Space Station (ISS) on Oct. 12, 2008. Hickman will not only be adding his digitized DNA to the "Immortality Drive," excerpts of his writings will also be included on the storage device Garriott will store on the ISS as part of Operation Immortality. The Immortality Drive is currently in the process of being loaded with information from people all over the world at the OperationImmortality.com website. Hickman will be talking about the project as he addresses crowds at the Gen Con gaming convention today in Indianapolis, Indiana. Visitors to the website can submit their suggestions for humanity's greatest achievements, leave their immortalized message for future generations, and may even have their DNA selected to join Garriott and other luminaries on an out-of-this-world trip to possibly become the future of mankind. Garriott is a game developer at NCsoft® and creator of the Ultima series of games and the recently released Tabula Rasa®. The goal of Operation Immortality is to have a space-borne record of human DNA and a record of humanity's achievements in the event a global calamity dooms the human species, similar to what happens in the Tabula Rasa video game. "Mankind is at its best whenever we set our vision to the stars," Hickman said. "One of my first memories was of watching Alan Shepard fly his Mercury capsule atop a Redstone rocket. I have lived my entire life dreaming of space. 'Operation Immortality' is essentially a celebration of that same adventuring spirit and an offering of hope for the future. I am deeply honored to participate." The Tabula Rasa team is thrilled by Hickman's participation in Operation Immortality. "Looking back to the influences that impacted my career, Tracy Hickman's Chronicles series left a lasting impression on me," said Tom Potter, Tabula Rasa's lead designer. "His novels were my first exposure to epic fantasy, and even though I read them at an early age, the setting and characters he created still continue to influence me all these years later."